Continuing our series of original art and photography inspired by subterranean London. More fun on the Tube today, with a collection of drawings and snaps from several readers. We're still looking for further entries...see bottom of post for details. 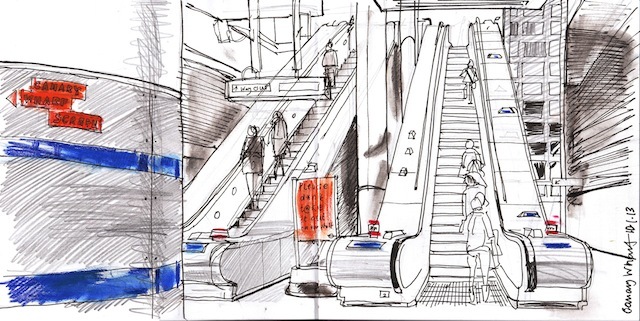 Lis Watkins sends us this colourful sketch of Canary Wharf Tube station. More from Lis on her online sketchbook. 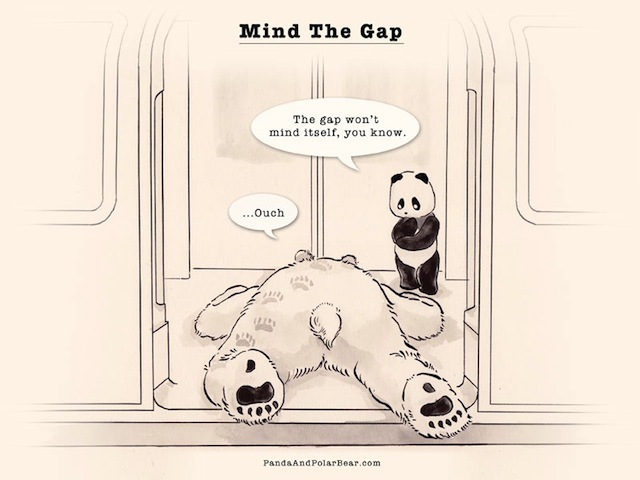 Louise Wei runs web comic Panda and Polar Bear, and contributes this nugget. "Everything in our comic is based on a true event and the characters are basically me and my husband. His epic fall on the tube floor last year turned into this drawing." Although, at first glance, this ink drawing by Michaela Hammond looks rather simple, if you zoom in (click the image), you'll see the tremendous detail. 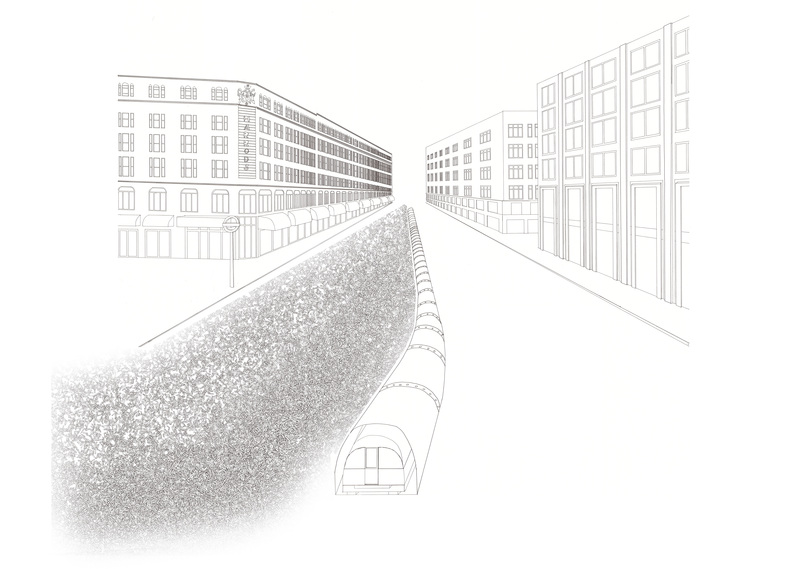 The image shows a Piccadilly Line train curving to avoid the ancient plague pits between South Kensington and Knightsbridge. Julie Leonard makes surreptitious iPhone drawings of her fellow passengers while travelling on the Tube, including the Galileo lookalike, centre. 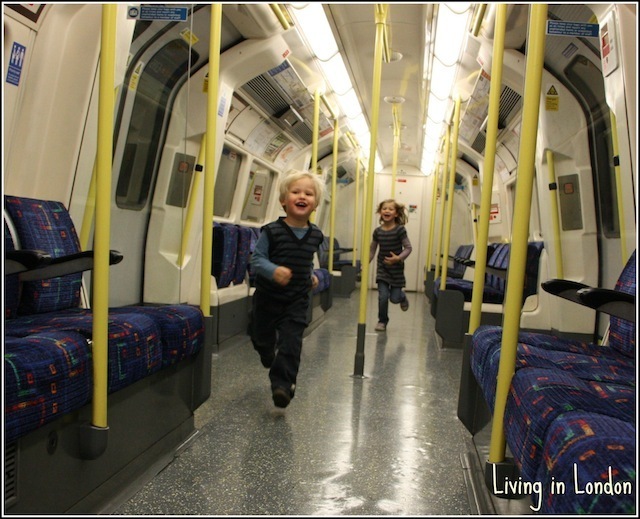 And finally...not a drawing, but a fun-filled photo of Claire Richard's children using the Tube as a playground. "People who always get caught in the rush hour will find it hard to believe, but it's true, you can run in there!" she tells us. We’re still looking for further images for this series…particularly drawings and illustrations (photos are smashing, but have now been over-represented). To enter, simply doodle an image of subterranean London — it could be something factual, like your favourite Tube station; or it could be fictional, like Boris Johnson's secret fun bunker (ahem). The best images will appear in a real-world exhibition at the Bishopsgate Institute, which we’ll announce more details about shortly…but to be considered, you’ll need to submit your entry to matt@londonist.com before Thursday 24 January.